It might be a good idea to pick a route into Kenosha other than Highway 158 (52nd) Street for a while. 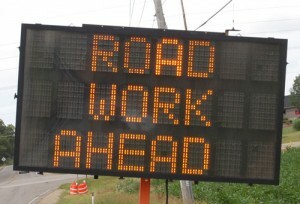 On Monday, June 1, the Wisconsin Department of Transportation (WisDOT) is scheduled to begin a three-mile resurfacing project on WIS 158, from WIS 31 to WIS 32, in the city of Kenosha. The contractor, Stark Asphalt, plans on completing the $2.6 million project this fall. One hundred percent of the project is paid for by state funding. Built in 1960, with its last rehabilitation in 1994, the WIS 158 roadway is deteriorated and is in need of repair. This reconstruction project will prevent the pavement condition from deteriorating to unsafe levels prior to a future reconstruction or larger resurfacing project. Other work includes; new Americans with Disabilities Act (ADA)-compliant curb ramps in some locations, improved bicycle accommodations, and new curb and gutter in certain areas. At least one lane of traffic will remain open in each direction at all times. To minimize impacts to motorists, construction will be staged to keep lane closures limited to about one mile at a time. The sequence will be as follows: Phase 1 – WIS 31 to Pershing Blvd. ; Phase 2 – Pershing Blvd. to 30th Ave.; Phase 3 – 30th Ave. to WIS 32. This project will connect with the 2014 completed resurfacing project of WIS 158, from I-94 to WIS 31. As always, we ask that drivers are courteous and careful when driving near the work zone.